I know that I’m not alone in being picky about cottage cheese. There are just a few brands I like, and I’ll often go without if I can’t find one of them. There are even countries where I just won’t touch the stuff. The large-curd cottage cheese served throughout the UK, for example, is definitely not my thing. 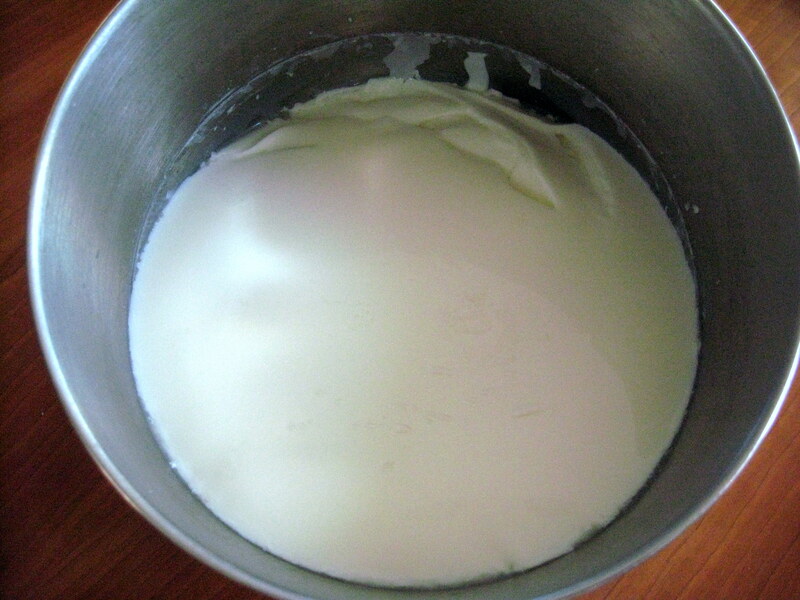 Curd size: Depending on how and when you stir the curds, you can make them small or large. 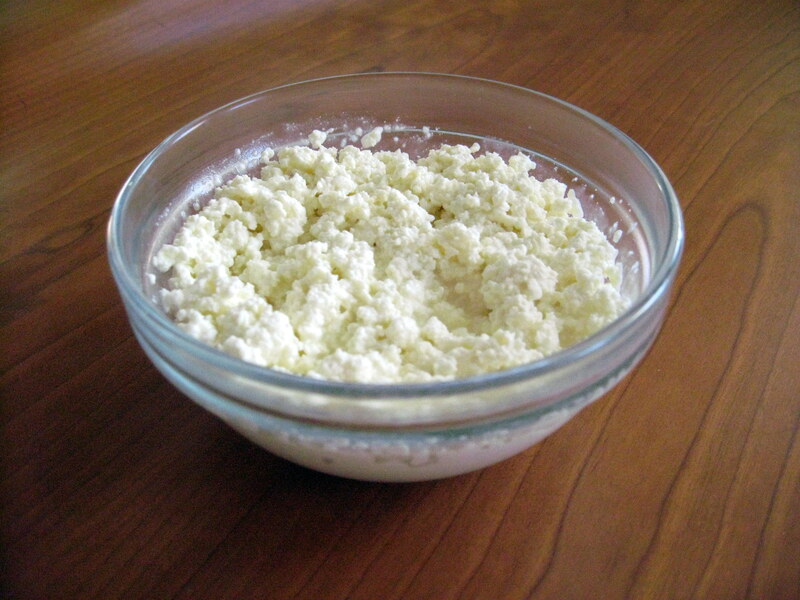 Curd texture: The longer you cook the curds, the tougher they are. Liquid content: You can stir in more cream at the end to make the cheese more of a liquid and less of a solid. Fat content: This recipe can be made with whole, 2%, 1%, or skim milk, and as mentioned the amount of cream can be varied. This recipe, which is adapted from David Lebovitz’s recipe (he uses much more cream) and from Ricki Carroll’s recipe (hers takes a lot longer), produces a cheese with small and pretty soft curds. It’s not particularly liquidy, and the liquid in question in question is cream so that’s no problem. It is definitely a full-fat dish. In fact, it’s rich enough that I might even serve it for dessert instead of breakfast. If that’s of concern to you, try substituting lower-fat dairy products. I can’t promise that they’ll taste as good, though. And don’t forget – whole milk is just 3.25% fat, which isn’t that much worse than 1% or 2%. 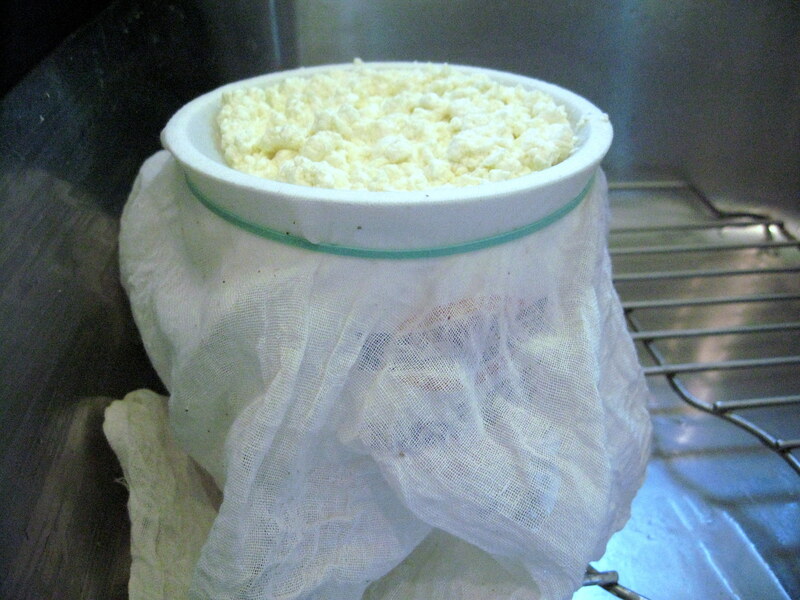 Place cheesecloth over yogurt container and secure with a rubber band around the top. Pull a little of the cheesecloth into the hole so that it hangs down a bit. Dissolve rennet tablet in water. 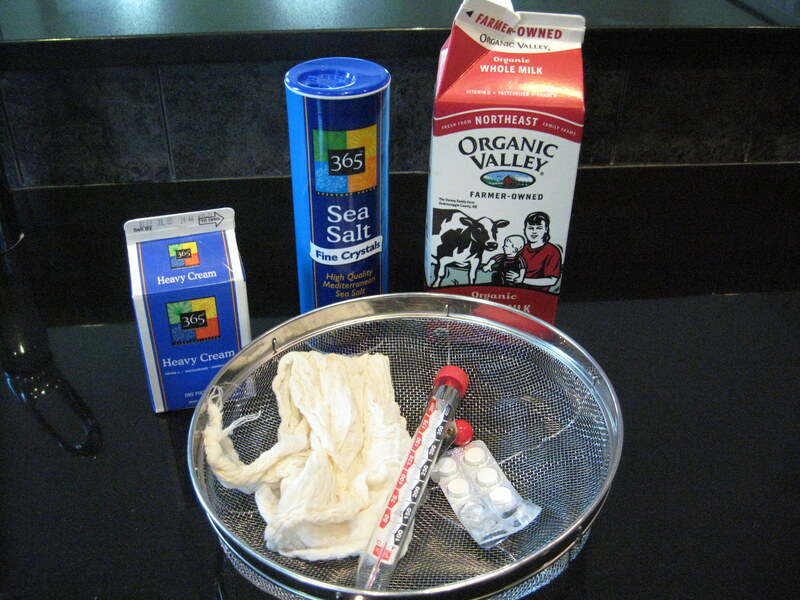 Put milk in pot and heat at medium-low until it reaches 90 degrees F.
Add rennet solution and give one or two stirs. 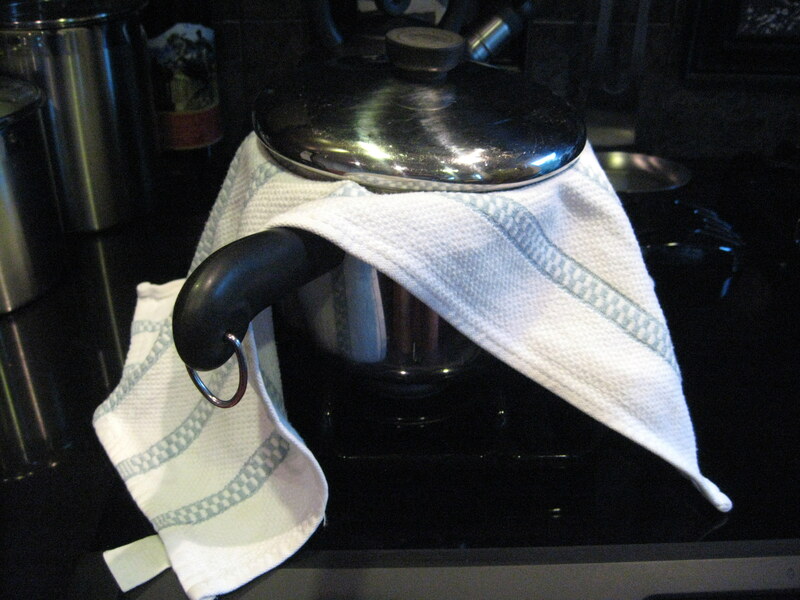 Turn heat off, place towel over pot, and place lid on top of towel. Let sit for 2-3 hours or until milk has turned into a wiggly, semi-solid, white blob that pulls reluctantly away from the sides of the pot when you tip it. 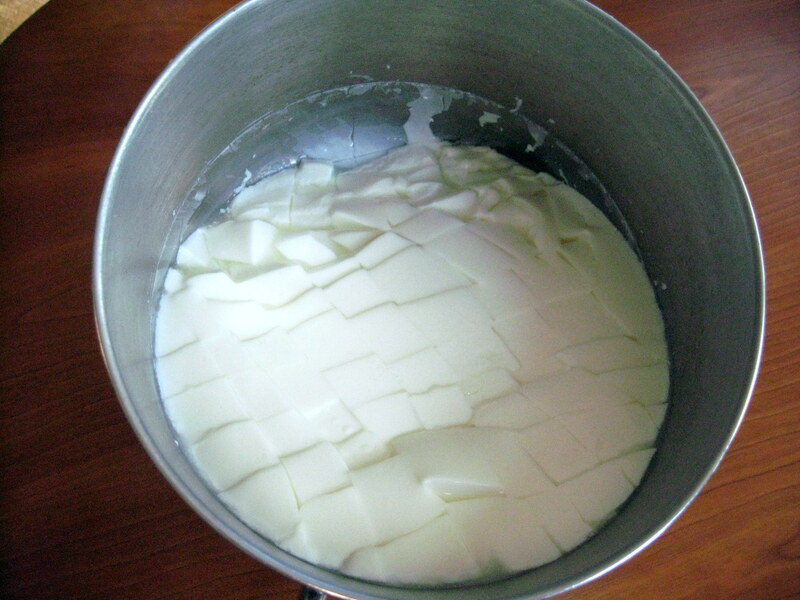 Cut the curds diagonally in one direction and then the other to form cubes. 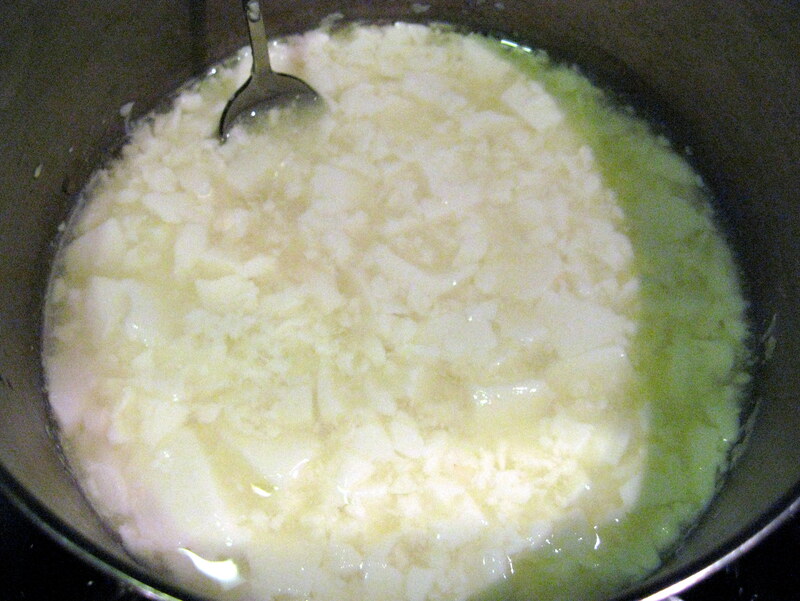 Turn the heat to low and stir the curds for 2-3 minutes, until they have fully separated from the whey. Increase heat gradually from low to medium over the course of 5-10 minutes, stirring occasionally as you go. The longer you cook, the tougher your curds will be. Taste them as you go, and remember that they will be about 2x harder after you drain the whey from them. Pour the curds and whey into your cheesecloth-covered container and let drain for 10 minutes, stirring and pressing occasionally. They may seem quite dry at this point, but don’t worry about it, because you’re about to add cream. Use a fork to stir in 6 tbsp cream (or more or less, to taste) and to break up the curds. I suggest serving with fruit or just eating straight. Lovin’ the post about store-bought tahini and homemade tahini. Now I’m thinking, is making homemade cottage cheese more cost efficient? If so, I’m game!